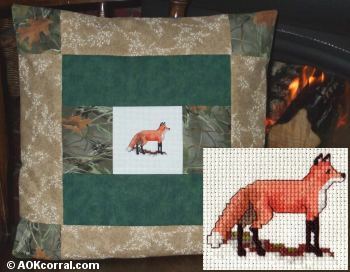 This cross stitch pattern is of a rustic red fox. Great for stitching as is or where you want to add a touch of rustic country like on our rustic throw pillow. Bonus: The Easy Print Version contains the directions for the rustic throw pillow. © Copyright 2008 by AOK Corral Craft and Gift Bazaar All rights reserved. The fox was stitched on 14 count cream color Aida cloth. You may use a different color of cloth to better match your décor but white is not recommended because you will not be able to see the white stitches of snow on the ground. Stitch this cross stitch design by itself or use it on anything where you want to add a little rustic or country style. © Copyright 2008 by AOK Corral Craft and Gift Bazaar. All rights reserved. 1.) Read or Print this project from our website, as is, for free. *This version includes the fox pattern and directions for the rustic throw pillow.